The verb ‘duren’ is used to indicate that an activity lasts a specific period of time, or that it is ongoing. It’s used in the same way as the English ‘to take’ or ‘to last’ (although ‘to last’ may indicate a more passive experience which is not explicitly clear when using ‘duren’). – “Dat/het zal mijn tijd wel duren”: that/it will last my time. (“I’ll be curious to see how the reorganization will go…” – “Oh well, it will last my time, I’ll retire soon…”). – Duur: length (of time) [noun] [de duur, <no plural>]. – Periode: phase, period [noun] [de periode, de periodes]. – Wachten: to wait [verb] [wachtte, gewacht]. – Voortduren: to drag on, to endure, to persist [verb] [duurde voort, voortgeduurd]. 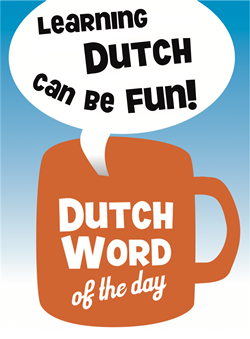 This entry was posted in Dutch word of the day, DWOTD 1.0, Vocabulary Basic and tagged duren, duur, periode, tijd, voortduren by Sander. Bookmark the permalink.